No-Cost Craft: Use a left over curtain rod mounted on two shelf brackets, and lots of modified wire hangers. For the rod, you could also use a wooden dowel, a piece of PVC pipe, or any other strong bit of metal. To mount it, bend up the tips of two metal shelf brackets and secured the rod with small screws, or use conventional closet rod hangers, found in any hardware store. 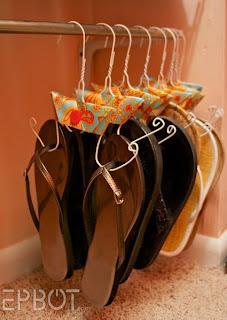 Suzanne Brown Hurley posted: ‎...or use shower curtain rods (spring tension rods)... then no brackets are needed. Neat idea! Nickey McKay posted: Open curtain rod hooks could work to hang them on also.